← Ibrahim Khalil Shihab Quartet exuded history, texture, and good ole acoustic jazz at District 6 Museum’s Homecoming Center last Friday evening, 27 May. Who is bassist Lionel Beukes? “After many years performing in China, I felt it was time to ‘come home’, join my roots again, and play our South African music and other standards, and maybe to teach the younger ones,” says Beukes as he proudly smiles his way through my interview. 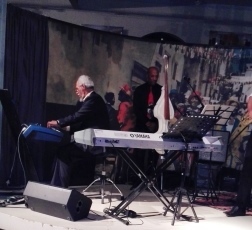 Back to his home town of Capetown for a little over a year, and newly married to a long time sweetheart, Beukes’ desire right now is to promote fellow elder musician, pianist Ibrahim Khalil Shihab, and pull the latter’s compositions out of the closet. Beukes also has songs penned in China to bring forth. Just turned 66 years old, Beukes has no desire to ‘retire’. “Retirement? When I retire I’ll be in my grave! I’m a musician and must help grow the music,” he exclaims when asked if and when he will settle into elder comforts. “Dedication and commitment is what it’s all about, and for now I plan to fully engage with promoting Shihab’s music and artistry after so many drought years he has had. I am also writing my own compositions, and together, we plan to get those songs registered with SAMRO and continue our business.” Beukes et al are approaching radio stations like Bush Radio and Fine Music Radio for sponsoring and interviews as well as performing with his older band, the popular Out of Town, at Swingers in Athlone on Sunday evenings. Beukes sees the need for a business approach in his music industry. “It IS about making money, but also having opportunities to work with the younger musicians as well. We aim at the concert hall stage rather than the club scene for live performances, where people can come to listen and appreciate, and pay for it.” Beukes is presently choosing his own band, including saxman Buddy Wells, known to play with everyone to date. Twenty year old Liam Webb, presently a student at CMI, is his drummer who will soon attend UCT’s School of Music. “Although I’m putting together the project, my acoustic quartet will include Buddy’s group, in order to promote him, and another piano player. We are all like family.” But sponsorship is key, he says, to finance promotions and recordings. Beukes plans to approach his old manager in Johannesburg to come on board again. Various collaborators are supporting the concert hall idea, and even recommending using school halls that are well equipped with sound systems. 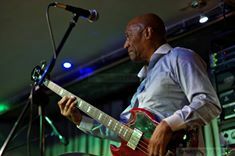 So the Beukes team aims to present more lively and vibrant acoustic jazz performances in South Africa’s major cities with the young and old timers.